Barbizon Lighting Company Blog: Visit Barbizon Lighting Company at NAB 2018 - Free Expo Pass Link! 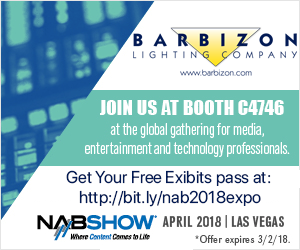 Visit Barbizon Lighting Company at NAB 2018 - Free Expo Pass Link! Barbizon will be exhibiting April 9-12 at the annual NAB Convention in Las Vegas showing customers the latest and greatest advancements in broadcast and content acquisition equipment. Our booth will be located in the Central Hall in Booth C7949. We will be continuing our free exhibit floor-based educational series covering topics that will be posted soon. Need an Expo Pass to NAB?